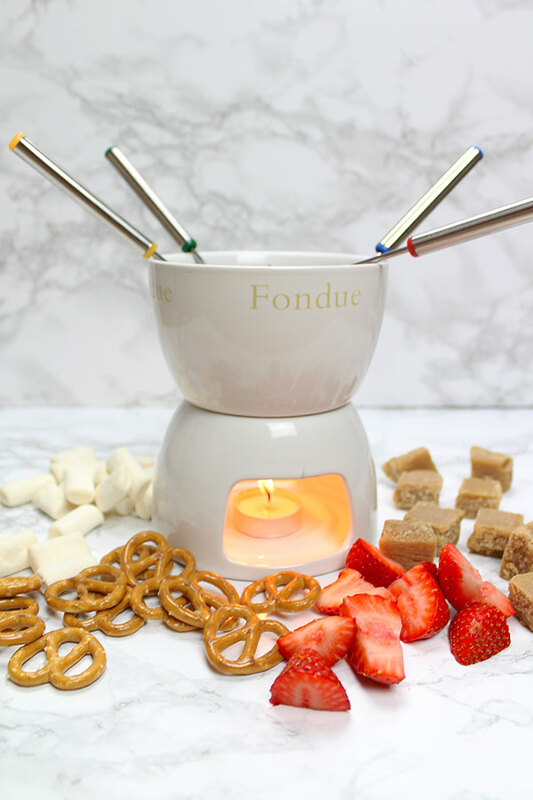 Want to learn how to make chocolate fondue? You’ve come to the right place! This vegan fondue is healthy, quick and easy, and contains only 2 ingredients! How do you make chocolate fondue without dairy? Traditional fondue is made with double cream and milk chocolate. Sometimes even butter! By switching the cream to coconut milk (you can’t taste it, promise) and the milk chocolate to dark, you’ve got yourself a tasty and simple chocolate fondue recipe. With just 2 ingredients, this recipe couldn’t be easier. And if you choose healthy dippers for your fondue, this can totally be a nutritious treat! To get started with this super easy recipe, put some full-fat coconut milk into a pan over medium-low heat. Once bubbles start to form, it’s time to add the chocolate. I recommend dark chocolate with at least 60% cocoa for best results, to prevent the chocolate from burning easily. 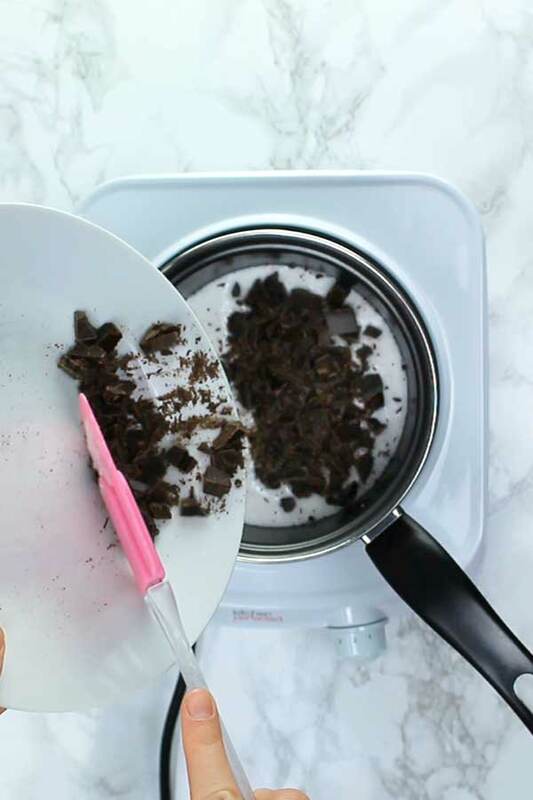 Stir continuously until the chocolate has completely melted into the coconut milk, then transfer into a fondue pot. 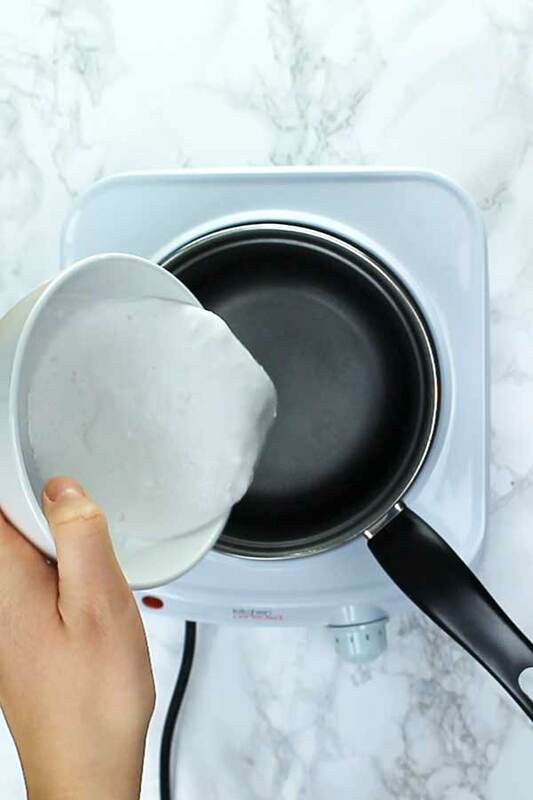 If you don’t have a proper fondue kit, you can either transfer the fondue to a slow cooker or simply keep the pot on the hob, on a very low heat. To dip, just use a regular fork or skewer. Now it’s time to choose what to dip! Strawberries, Pretzels, Banana, vegan marshmallows and vegan fudge. Before going vegan, I didn’t put too much effort into my chocolate fondue ideas. I basically just dipped anything I wanted. But of course, being a vegan isn’t always quite as simple! I had to do a bit more thinking this time. The cheaper versions of these cookies/biscuits are more likely to be vegan-friendly. But be sure to double check as different brands will vary. Bonus tip for leftover vegan fondue! If you have any leftover fondue, wait for it to cool down then place it in the fridge overnight. In the morning, roll the mixture into little balls to make super creamy vegan truffles! Check out my latest chocolate truffles post for decorating ideas. 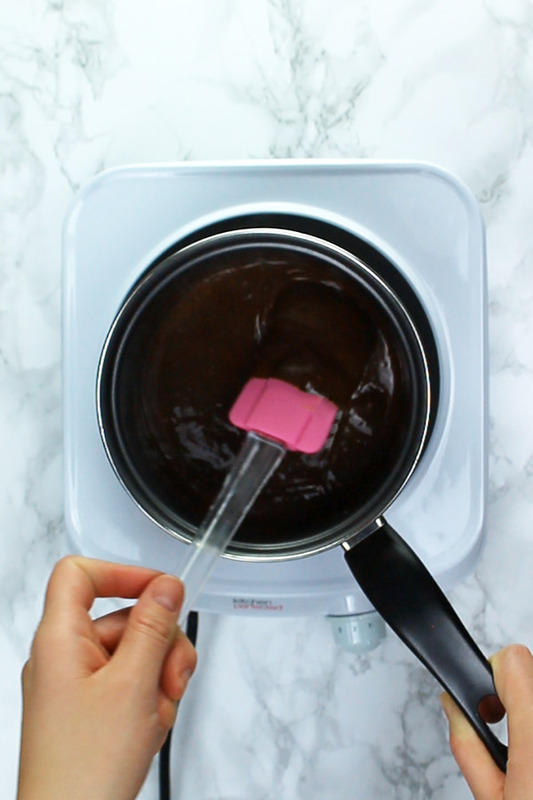 I hope you enjoy this chocolate fondue tutorial! If you decided to give it a go, use the hashtag #bakedbyclo on Instagram so I can see and share! 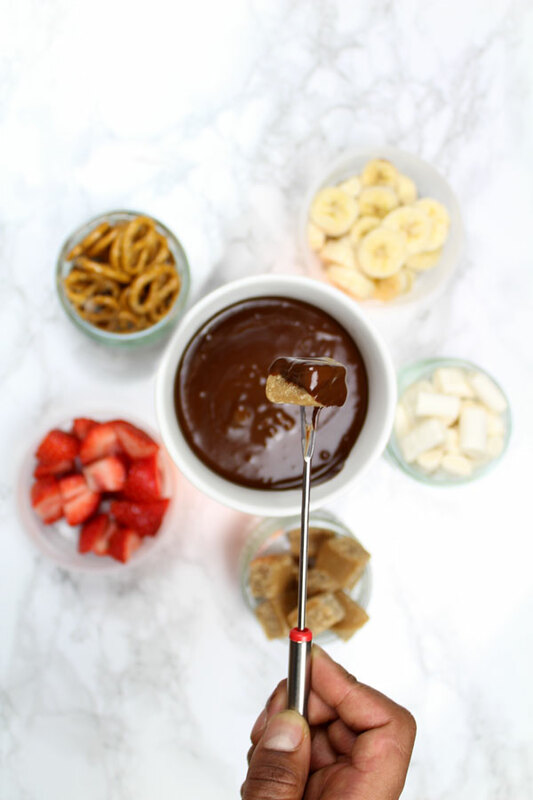 A dairy-free, healthy chocolate fondue that is perfect for sharing! Gently heat the coconut milk over a low heat. When it starts to bubble, add the chocolate. Stir continuously until the chocolate has completely melted into the coconut milk. Pour into a fondue pot and serve with dipping items. *Refrigerate any leftover fondue overnight and roll the stiffened mixture into dairy-free truffle balls!